We know, advertisements are annoying and slow down the internet. Unfortunately, this is how we pay the bills and our authors. We would love for you to enjoy our content, we've worked hard on providing it. Please whitelist our site in your adblocker, refresh the page, and enjoy! 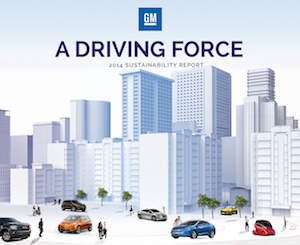 General Motors sustainability report for 2014 attempts to chronicle the automaker’s efforts to make electric and hybrid vehicles more mainstream, implement responsible manufacturing practices and address other prominent sustainability issues in the automotive industry. According to the automaker, its actions outlined in the report will help to “further drive sustainability into the company’s culture,” as the auto industry undergoes a period of major change in coming years. At the top of GM’s sustainability report is information on its stance towards electric vehicles. The automaker believes “the future is electric,” and took several actions to back up this sentiment last year, including extending the availability of the Spark EV to Maryland and certain Canadian provinces, committing to production of the all-electric Chevrolet Bolt, and giving the all-new 2016 Chevrolet Volt a lower base price than the previous model. It also noted the billions of dollars the company has invested in order to support an “all-in-house” approach to developing and manufacturing EVs. GM made efforts to make responsible manufacturing practices more prominent at its various facilities around the globe last year. The automaker says it ended use of coal at its North American plants entirely in 2014 and now uses a total of 105 megawatts of renewables, up 66 MW from 2013. It also added a total of four solar arrays to different plants, expanded the use of landfill gasses at its Orion Township and Fort Wayne plants and began using steam generated from local municipal waste at its Detroit-Hamtramck plant. Expanding on its responsible manufacturing efforts, GM hopes to become the first automaker to have all its manufacturing sites sending zero waste to landfills. It already runs 122 landfill-free facilities around the world and recycled over 2.5 million metric tons of waste and materials in 2014, which is roughly equivalent to 10 million metric tons of CO2-equivalent emissions. In addition to these improvements, GM also made strides in 2014 towards its 2020 global manufacturing commitments with a 2010 baseline. These include reducing water intensity by 11 percent toward a goal of 15 percent, reducing energy and carbon intensity by 11 percent toward a goal of 20 percent and reducing total waste by 23 percent and establishing a new target of 40 percent. More environmentally friendly efforts GM made in 2014 can be read in detail in the automaker’s sustainability report at this link. Check out the latest forum discussions at the GM Authority forums! The Culture of GM is much deeper than this. The Changes in the way they go about things and how they do business internally is where the greatest changes have happened and need to continue to happen. Cutting water use and creating more EV’s are just the product and social end. The real way they will continue to change is how they go about creating new product and communication on what they go about building, designing and testing them. In other words they will for the first time in years have the left hand knowing what the right hand is doing. No more 5 part numbers and prices for the same part. Subscribe for free to receive our daily newsletter in your inbox. Alex Luft on:Ask Away: What Do You Want To Know About The Cadillac CT5? GM Authority is a must-read for GM news, GM rumors, GM reviews, and information about General Motors vehicles. Join others in discussing The General in our GM Forums and browse photos of GM vehicles in our GM pictures gallery. Please note that GM Authority is a product of Motrolix LLC and is not sponsored, owned, or in any other way condoned by General Motors Company, its brands, subsidiaries, or partners. © COPYRIGHT 2019 POWERED BY LSX V8 ENGINES, LOVE & REVERENCE.